I'm glad to see Karen Allen is in this. She looks hot for how old she must be. The score is out tomorrow in case you soundtrack collectors are interested. I already have my midnight showing for Wednesday night. they are going to kill Indy. The movie novelization should be out by now as well. I already know this has too much Shia LeDouche in it. Is it too much to hope for a cameo (at least) of Sean Connery? But then again they did make Live Free or Die Hard. According to that newsarama article, it was planned that there would be 5 movies in total anyway. Why they seemed to stop at 3 i don't know, maybe ford got sick of the character. I don't know why it took so long, but there was always an intent to make a 4th film. And Ford has always liked the character of Indy so I don't think the delay was because of him. IGN has their review up too, but I don't trust IGN reviewing movies. Hell, they gave SPEED RACER a 9 and bashed Prince Caspian. I am curious if they are going to have a boat load of digital stunt double effects. It's supposed to the third best in the series which is actually saying alot, above Temple of Doom or Last Crusade depending on your tastes. I LOVED Temple of Doom, so there's a good chance I'll really like this movie. Holy I'd be pissed if that were my car. I heard some reviews saying its really cheesy and Blanchett does a over the top accent that turns comical. Im still going Wednesday at midnight... I still have hope. Why compare TPM to this ? Lucas admitted that he wanted it to be kiddy friendly thus we got a "yippy!" Anikin and Jar Jar. The Indiana Jones films were never ment to be Corny. Lots of action, ok dialog, good special effects where the bad guys get blown up good, chopped up, mowed down, splattered and so on. I wonder what creepy crawlers will be in this movie. Can't be snakes, bugs, or rats.... what could it be that could top those 3? I hope they do that paramount mountain logo trick like they did in the beginning of each movie. I can just hear someone trying to explain that to their insurance company. "Well, i walked outside and there was this giant lego boulder leaning against my car..."
:Well, i walked outside and there was this giant lego boulder leaning against my car..."
I'll be seeing this tomorrow night so I'll let you all know about the spoilers. Have you seen Speed Racer? The movie was awesome as long as the kid inside you wasn't dead. 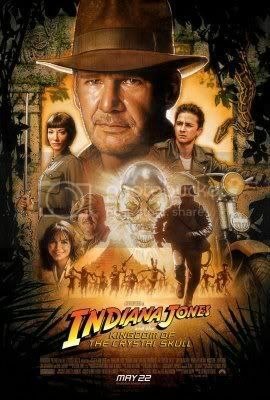 Might give it a go, never seen any of the Indiana Jones films. I like Shia LaBeouf, $$$$a was straight filthy in Holes. Disturbia and Transformers were pretty sick too. Funny enough, a couple years ago when 'Even Stevens' was big on the Disney Channel, me and my friends always thought that the chick Ren would go big, not Shia. I am gonna laugh so hard when the local news stations ask movie goers how was the movie and some idiot will say "I took my son to see this movie and it just raped not only my childhood memories but now it did damage to my son...thank you mr. speilburg!!" Why all this hate towards Shia? He's an ok actor. No one special.